Laurel Creek Landscape Nursery Ltd.
grown Hydrangea. Our pot sizes are from 5 to 25 gallon. We have been in the maintenance and installation business for over 30 years. We provide a full range of construction services. Country/Private roads a specialty. 2) Final grade and surface drainage. c. Oil and Stone top coating. e. Lawns seed or sod. We began as landscape gardeners 35 years ago and provide all phases of property maintenance. We are competitively priced. Contact us for rates. We are located on the North Fork of Long Island at 1902-2050 Main Road Laurel and specializes in growing many varieties of hydrangea. Come by our Nursery, give us a call or email us for your Hydrangea needs. We are a wholesale Nursery, but do run yard sales to the public during blooming season. Get on our email list and we will let you know when we have specials at our yard. I graduated from Brown University with a bachelor of Science degree in Geology. I have studied the Flora and Fauna of the East End my whole life. At Brown University I mapped the Salt Marshes and studied Paleoclimatology, giving me an understanding of forest progression since the last Ice Age. Our unique blend of eco systems and estuaries is my passion. I started trimming privet hedges at the age of 13 and was doing it for many of my neighbors by the age of 14. I have been an avid bird watcher since the age of 8. 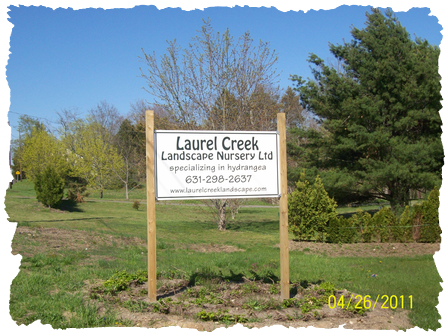 Our nursery is at the head waters of Brushs Creek in Laurel where my wife Vivian and I live and grow our hydrangea.